With a 10-alarm fire in Waltham, Massachusetts, being determined to have been intentionally set, the NBC Boston Investigators are looking into construction materials that may cause flames to spread even faster. 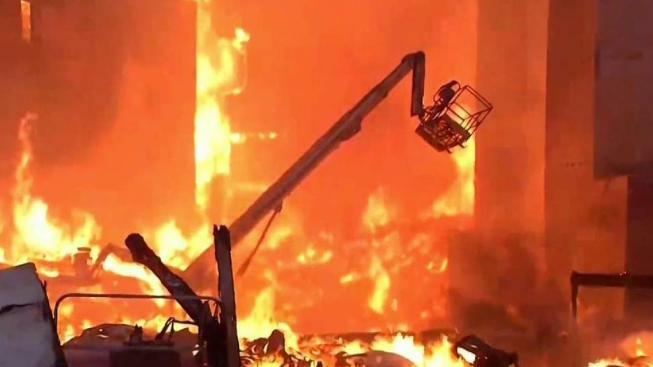 Massachusetts officials are talking about the state fire and building codes after two large wood frame buildings burned this summer, the state fire marshal says. Fire Marshal Peter J. Ostroskey and Waltham Fire Chief Paul Ciccone announced Thursday that the cause of the Waltham blaze on July 23 was arson. Pressed on whether using wood in a project of that size was problematic, Ciccone said he did not want his press conference to turn into "a referendum of wood frame construction." But Ostroskey said his office is having conversations with the state agencies that oversee the building code and the fire code. "Right now, we have a working group, discussions ongoing," he said. Robert Solomon, the building fire protection division manager with the National Fire Protection Association, said NFPA recommendations and standards have been adopted in all 50 states. Their recommendations cover arson prevention for construction sites. Those include installing fences and surveillance cameras, and hiring guards to watch the property overnight. They also recommend turning on sprinkler systems as soon as a floor is completed, and keeping ignition points to a minimum. "We're trying to understand why those provisions aren't being adhered to properly," he said. Solomon has been keeping track of the number of structure fires, and has noticed an uptick. "We saw probably seven or eight of these large fires across the U.S, literally coast to coast this year," he said. "We happened to have two in the Boston area. So during that construction phase, the building no question it's vulnerable to a fire event, and at NFPA we actually have a standard that deals with that." He said he wants to understand what is working and what is not before pushing for new codes or standards. "I think if we look at the issue with the vulnerable point, with buildings under construction," Solomon said. "We have tools there, I mentioned NFPA 241, and we have this whole design process, plan review process, inspection process. So we also want to make sure that those things are working, and maybe some point, you know, we go back to revisit the number of stories." Solomon would also like to see cities and towns do more inspections to prevent accidents and mistakes—like the misplaced diesel generator exhaust pipe blamed for starting a condo fire in Dorchester in June—from turning into infernos. "Ideally, we'd like to see more inspections, you know, during the week or during the month, whatever the case might be. But most of these jurisdictions, they’re strapped for that resource," Solomon said. Anyone with any information about the Waltham arson case should call the state arson hotline at 1-800-682-9229.